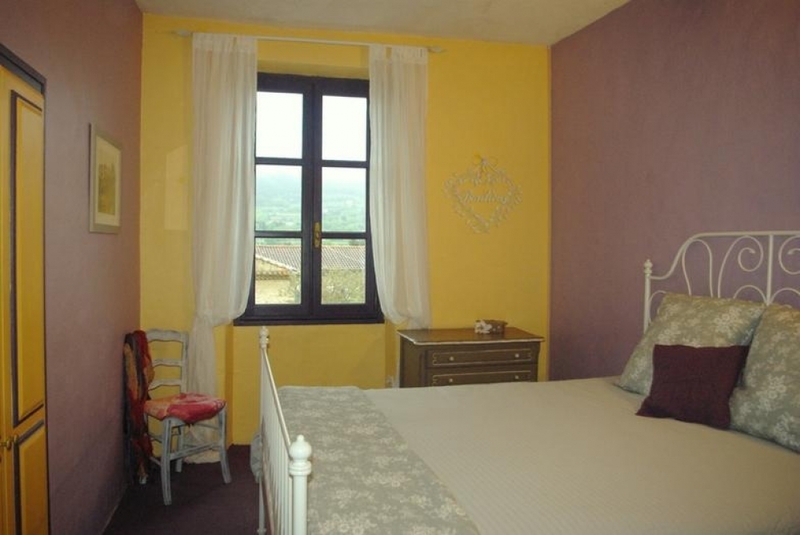 A beautiful old 3-story Provencal stone house, which has been lovingly updated. 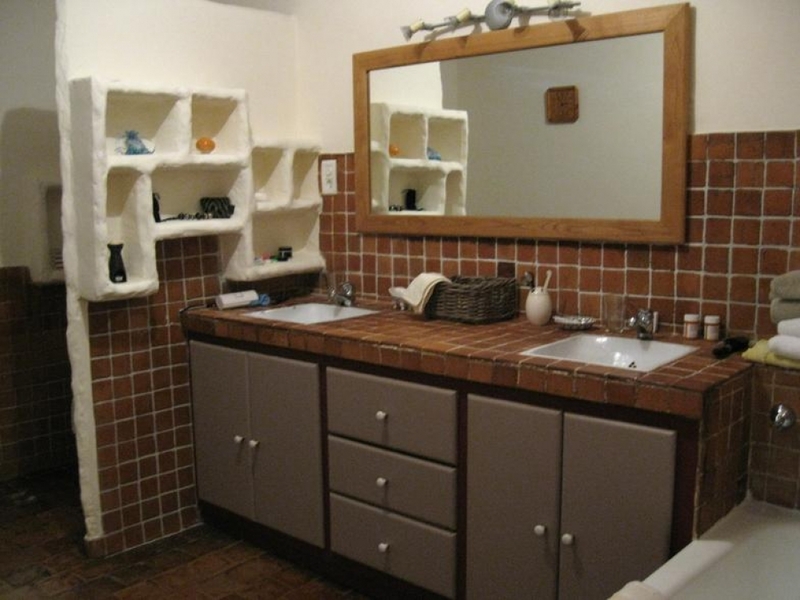 The property is ideal for visitors who want to feel the pulse of village life. Sablet is a charming village uniquely located to access the many attractions and delights of the Vaucluse region of Provence. It is set in the heart of Côte du Rhône wine country. 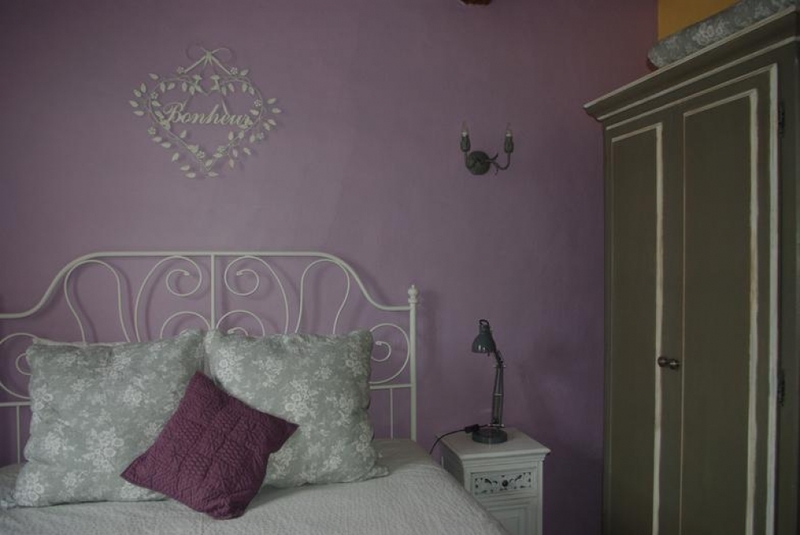 Built into the 12th-century ramparts of the medieval part of the village, this beautiful old Provençal stone house serves as a local landmark because of the hole in the wall--'le trou'--which creates the terrace. 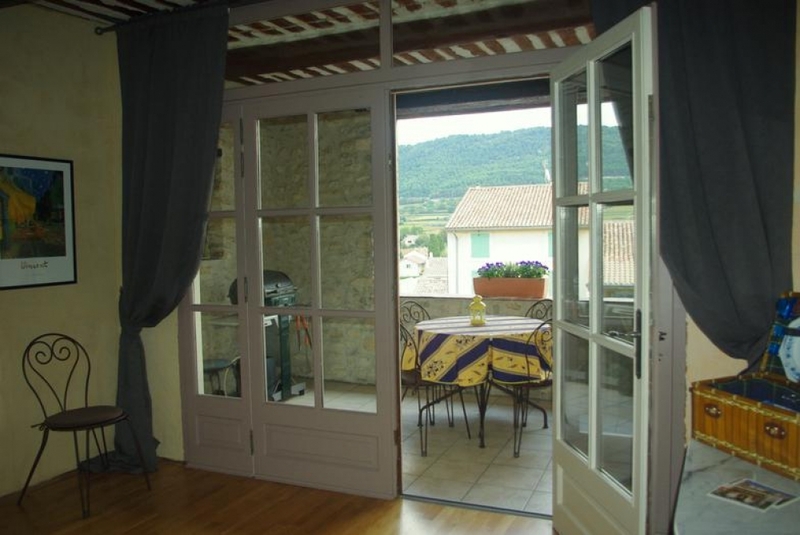 Ideal for visitors who want to feel the pulse of village life, this house has a flower shop and a boulangerie as neighbors. 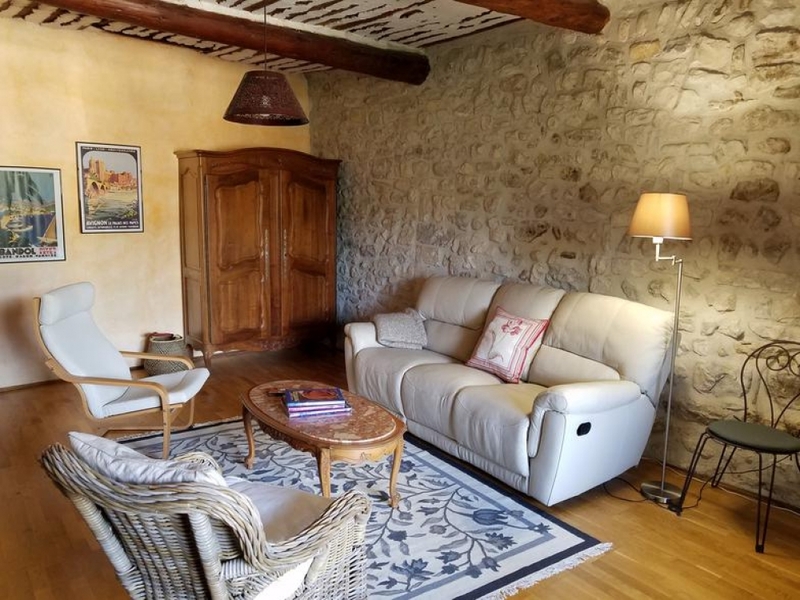 Throughout, the beauty of walls of locally-quarried stone, traditional Provençal ceilings of plaster and dark exposed beams, and handsome traditional tiles give “La Trouvaille” its special warmth and character. The house is spacious and inviting, providing an unusual degree of privacy with separate relaxation areas on each floor. 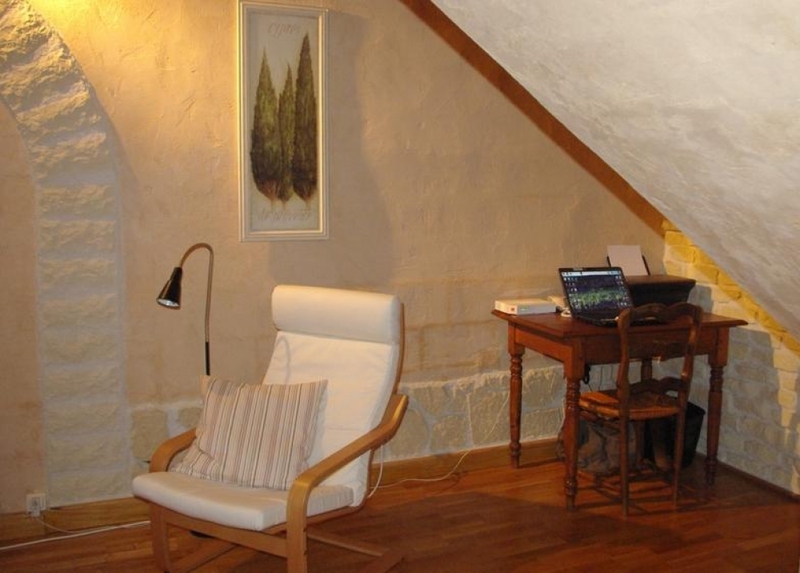 Furnishings reflect the owners' enthusiasm for Provençal style and regional crafts. Handsome antiques, shabby chic “finds” and quality reproductions are placed alongside comfortable leather sofas and more casual seating. Owners have taken special care to add modern comforts, while sacrificing none of the house's Provençal charm. 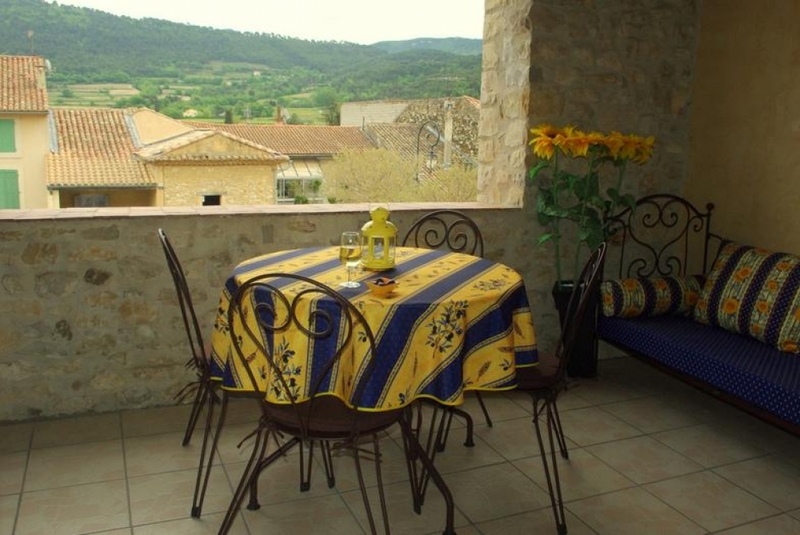 A shaded terrace is cut into the stone facade of the house and faces east with fine views of the clay-tiled rooftops, vine-covered hillsides, a picturesque neighbouring village and the dramatic limestone ridges of the Dentelles de Montmirail. A round table and chairs invite "al fresco" dining and a gas grill is provided. For relaxing or reading there is an antique daybed with cushions in a cheerful Provençal fabric. This terrace provides shelter from the hot mid-day sun, as well as protection from winds or occasional rain, enabling guests to spend even more time enjoying the views. 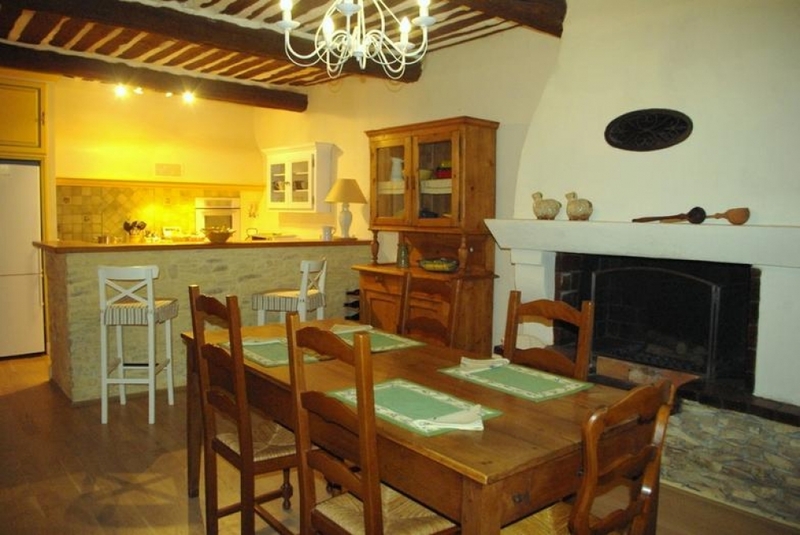 Upon entering the house there is a large dining and gathering area with great character and Provençal charm. The kitchen is well-designed and equipped for preparing a gourmet meal or a casual picnic to be enjoyed on the terrace or outdoor in the hills among the vines. A handsome antique oak farm table seats 6-8. Colorful pottery is provided for cooking and serving. Adjoining the kitchen is the day room and extra sleeping area. A comfortable daybed converts into a pull-out queen-sized bed. The entertainment center features a 42” flat-panel television with 130+ internet channels (French language) and Blue-ray home theater system for music and video. The HDMI television has Chromecast and HDMI cable for fast broadband streaming. In addition to the sofa are two comfortable chairs and good reading lamps. 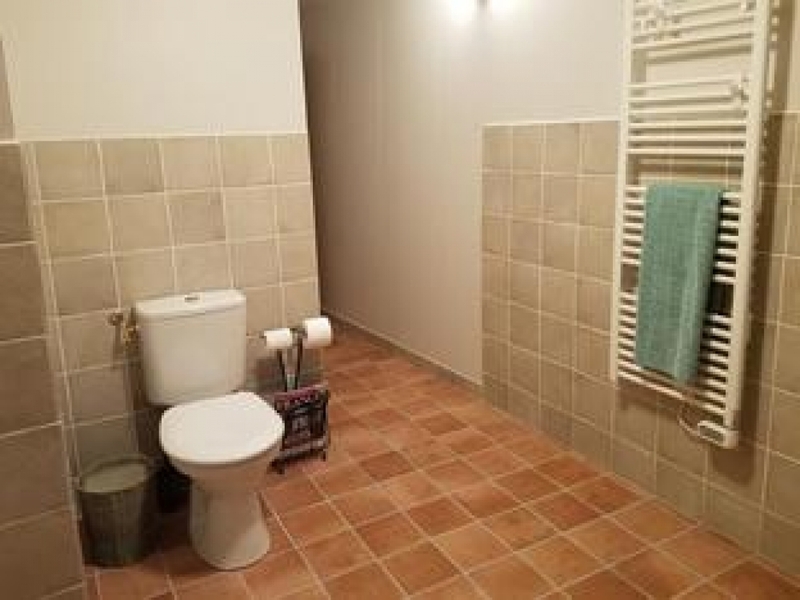 Nearby is a small WC--toilet only--convenient to the kitchen and the day room. 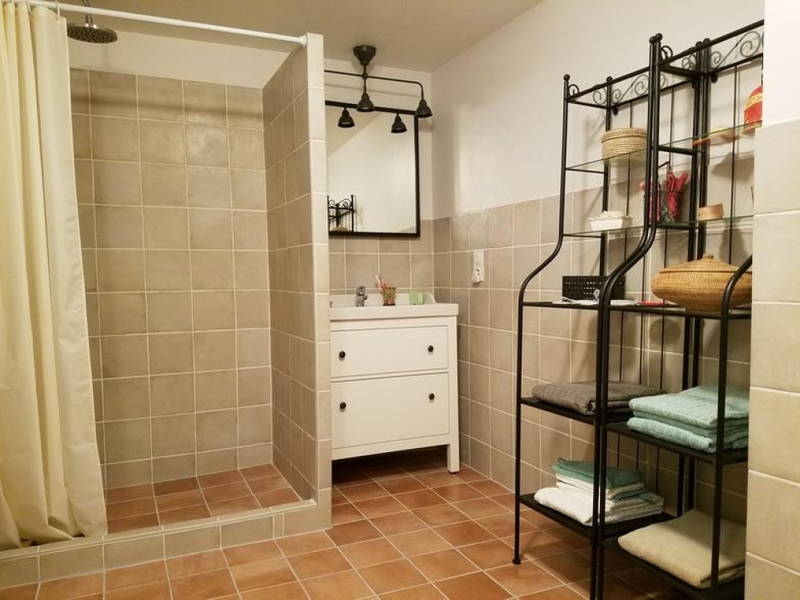 Adjoining workroom and laundry provide a sink, washer/dryer, ironing board & iron, ample storage. WiFi is provided throughout the house. Guests must provide their own computer, but a printer is available. Internet-based phone service allows us to offer free international calling to land lines and to U.S./Canadian cell phones. 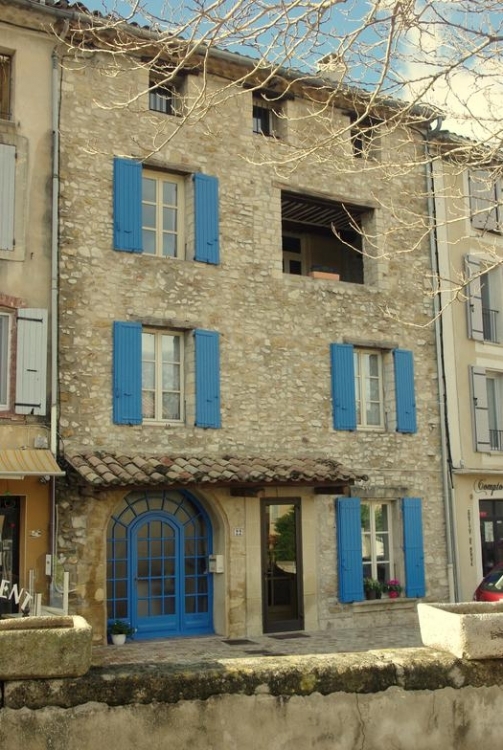 A beautiful old 3-story Provencal stone house, lovingly updated. Ideal for visitors who want to feel the pulse of village life. 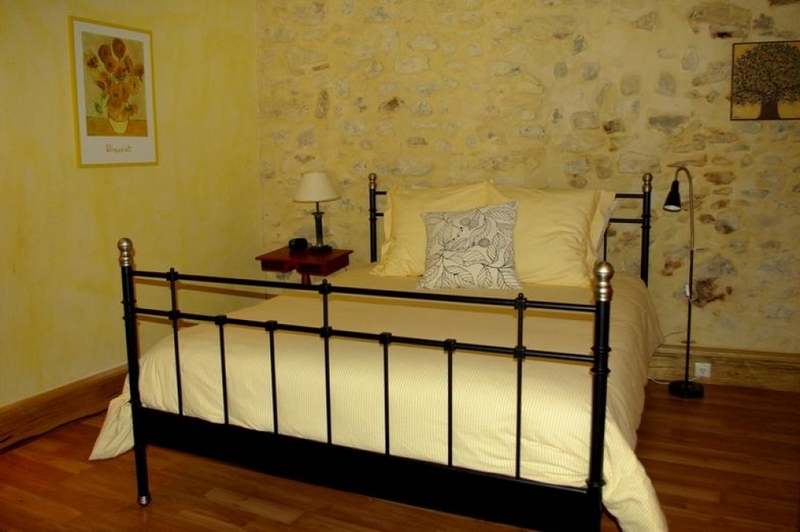 It is set in the heart of Cote du Rhone wine country. A deposit of 20% of the total rental price is required within 7 days of the initial reservation to guarantee the dates. Full payment is due 60 days before arrival. Methods of payment include credit card or direct debit via PayPal, bank transfer. Cancellations made more than sixty (60) days prior to the arrival date are subject to a $75.00 / 50 euros cancellation fee. Cancellations, or changes that result in a shortened stay, that are made within 60 days of the arrival date, forfeit the full rental amount. If we are able to find another guest to rent our house during your rental dates, we will refund to you as much of your payment as we are able to cover by the new rental minus a $75.00 / 50 euro administrative fee. Cancellation or early departure does not warrant any refund of rent. We highly recommend that guests obtain travelers insurance for their vacation. Check-in / Check-out days are generally Saturdays. Whenever possible, we will be flexible to meet your needs. Please inquire. Unlike many surrounding villages, Sablet's center is not bisected by a major roadway, so the round medieval center is refreshingly free of most vehicle traffic and strolling the narrow spiraling streets and stairs to the 11th century church and its little park at the top of the village is a delight. Place du Barry provides a splendid view of rooftops, vineyards and provides an orientation table that identifies villages in the distant hills. Sablet is uniquely situated to provide easy access to many attractions in the Vaucluse. 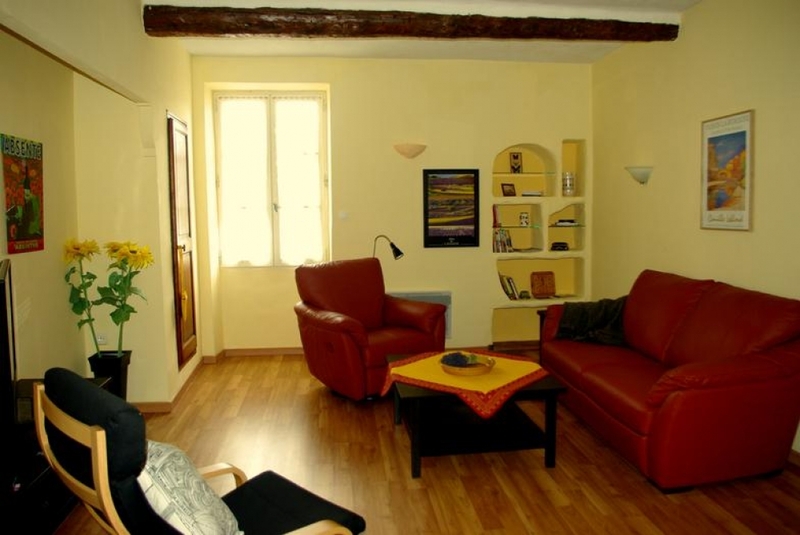 You will have so many choices of how to enjoy your time in Provence! Explore Roman ruins or attend a live production in an antique theater in Vaison la Romaine or Orange. Visit a different Provençal market every day of the week, including our favorites in Vaison, Bedoin and Ste.-Cecile-les-Vignes.